A kind old father, grandfather and great-grandfather was called to his reward when Frank Marth died Friday evening, February 5, 1937, at 8:15 o’clock, at the home of his daughter, Mrs. Selma Leas in this city, with whom he made his home during the last years of his life and who administered to his needs during the time of his last ailment which was from the time of the death of his beloved wife; he died at the age of 79 years, 3 months and 11 days. The funeral was held on Monday afternoon from the house, services were held in the Evangelical Bethel church in this city, of which he was a member for many years. The Rev. D. C. Jensen of Lexington preached in the English language and the Rev. R. C. Lucke of Emma delivered a sermon in German. The congregation and the Bethel church choir sang songs of hope and faith. After the services the body of the old pilgrim, whose last words were, “Now I want to sleep,” was laid to rest in the Evangelical Bethel cemetery where so many are sleeping to await the awakening by their Savior and Redeemer. The pallbearers were Martin Holsten, William Stiegemeyer, James Holtcamp, William Dreyer, Claus Lorenz and George Cordes. The flowers were carried by grandchildren; Marion Leas, Johnnie Marth, Erleen Marth, Dorothy Schollie, Clara von Holten and Elverna Fricke. Frank Hermann Marth was born at Lüsnig, near Strehla on the Elbe in the at that time Kingdom of Saxony, Germany, on October 25, 1857. He was baptised and confirmed in the Evangelical Lutheran church. His parents, brothers and sisters all preceded him to the Great Beyond. In his youth he served for a number of years in the Royal Saxony First Brigade, probably in Dresden, the capitol of Saxony. In October 1882 he came to the United States and to New Essen near Pittsburg, Penn., then he went to St. Paul, Minn., then to Iowa, thence to Corder, Mo., where he worked as [sic] coal miner, then to Concordia where he engaged in farming. Mr. Marth was also a mason which trade he learned in Germany. On June 13, 1887, he was married to Miss Mathilde Lueck, by the Rev. H. Mohr, at that time pastor of the Bethel congregation at Concordia, Mo. who preceded him in death. The union was blessed with nine children, three of whom preceded him in death; those living are Anna, Mrs. Theodor von Holten, Emma, Mo. ; Martha, Mrs. Schollie, Concordia; Bertha, Mrs. John Fricke, Sweet Springs; Otto, Concordia; Selma, Mrs. Leas, Concordia; Herbert, Higginsville. He also leaves 16 grandchildren and three great-grandchildren, two sons-in-law and two daughters-in-law and many relatives and friends. Our sympathy to the mourners. 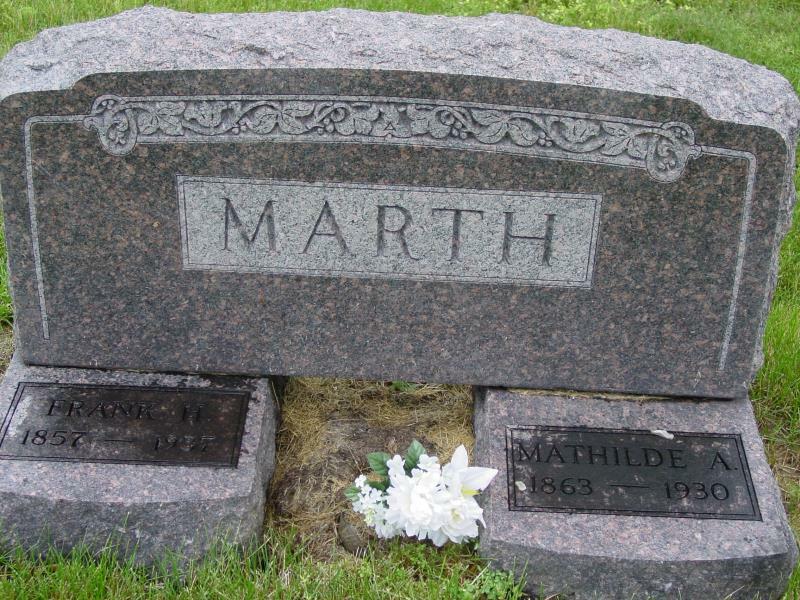 Frank H. Marth was my g-g-grandfather.